Your 1 BR suite is located in the Heart of the Village of Bear Mountain Golf and Country Club Mountain Resort. This 600 sq ft Luxury suite overlooks the 3rd Fairway, and the Village of Bear Mountain. The 36-hole Golf Course is co-designed by Jack Nicklaus and his son Steve. There are in fact two courses... The 'Mountain Course' and the 'Valley Course'. They are both set in the foothills of Mount Finlayson and strike the perfect balance between playability and a year round golf experience for golfers of all skill levels. With panoramic mountain, city and ocean views and located only 10-12 minutes from downtown Victoria... You'll fall in love with this world-renowned Golf Course and Village Resort. Bear Mountain has recently opened the 'Valley Course'... A second Nicklaus-designed 18-hole championship golf course which offers the same world class facilities as the first 18-hole Mountain Course. The new Valley course is a par 71, reaching 7,000 yards from the championship tees, and makes Bear Mountain the first 36-hole Nicklaus designed golf resort in Canada! And for those guests who would rather explore than putt... There are many opportunities just minutes away from your own front door to explore, go antiquing, rest & relax at the Westin Resort Spa where the 'Full Body Massage' is to-die-for; or you can venture off to Jack's (Nicklaus) Pub & Restaurant for some of the best wings in town. Please Note the Pool is located next door at the Westin and requires a fee to use the facilities. Or you can catch the Trolley during the summer months and venture down the hill where all the box stores are - From Winners and Home Depot, to Costco, Wal-Mart, and the Brick. Plus lots of restaurants, and gift stores to browse. Your home-away-from-home includes 10 ft ceilings; Granite, Tile, and Warm Chestnut colored Laminant throughout; Stainless Steel Appliances; In-Suite Laundry; and a gas Fireplace. This is a brand-new suite that is professionally designed and decorated and includes a private bedroom with a King-sized Sealy Mattress with additional memory foam added to increase the height and comfort of your bed. The 600-1000 thread-count sheets and non-allergenic down-comforter will also ensure that you have a restful nights sleep. While enjoying your breakfast from your private balcony, you can watch the golfers on the 3rd fairway pass by your elevated suite. Or you can look further down to see all the activities at the Golf Course Club House and local Town Market (due to be complete 2008). The fully-equipped oversized kitchen features a large separate granite island with an eating bar for 2-4 people. The comfortable living room is tastefully decorated with a new leather (double-sized pull-out) couch that sleeps 2 more guests; a gas fireplace; a 36' flat screen wall mount TV; quality stereo with CD, tuner, and iPod/MP3 connections. The bathroom has Tile and Granite throughout, with a contoured tub and shower unit. This luxurious condominium offers the traveler a truly unique experience when visiting Vancouver Island... You can venture up island for the day and go caving at Horne Lake, or whale-watching a 1/2 hour away in Sooke, or spend your vacation on the Mountain in the 'Whistler-like' Village, or even drive downtown and go antique shopping or beach combing in Victoria. Owner lives in Edmonton, AB Canada, and purchased their suites in Bear Mountain during the initial construction stages back in 2006. Frank was looking at creating a home away from home... With Frank being an avid golfer, and Bear Mountain being ranked as one of the best (36 hole) courses in Canada, it was an easy decision on where to purchase. Not to mention the Resort is ideally located with quick and easy access to downtown Victoria, the Highlands, Sooke, and the upper Island destinations. The Resort is similar to Whistler in that you feel like you are in an Alpine resort with all the Luxurious amenities, yet you are also a 12 minute drive into Victoria BC with all of it's tourist attractions and famous landmarks. The Highlands (where Bear Mountain is located) has been fully developed with all of the large Box Stores like, Costco, Walmart, Home Depot, etc... It's just an ideal place to relax, breathe the mountain and ocean air, and even shop or go on tours by day, and enjoy the restaurants and nightlife by night... Or if you'd rather you can stay in at night, and light up the BBQ (and fireplace) and enjoy the view of the heart of the village, with a nice meal, while lounging out on your large balcony. It's all good! The location is perfect, little market, golf course and restaurants within walking distance. Thank you so much for you review, the condo is quite lovely. I did call Shaw while you were staying at the condo, I had asked you to power down the modem and reboot. I did state that if the problem continued I would need Shaw to call you directly to troubleshoot to get it working. I'm sorry that you feel you had no support. Glad you enjoyed your stay otherwise! Great location, quieter than a hotel, king bed was super comfortable. Short walk to fabulous 36 hole Bear Mountain golf course and great restaurants! Washer and dryer in the condo was a plus. We stayed for 8 nights and visiting the sights in downtown Victoria was a short drive. Great layout, very clean, beautiful view. Just an all round great experience. Attractive looking place but a painful experience. When I first arrived and saw the unit I was impressed by how new and fresh it looked. Unfortunately my experience went down hill from there. First, I noticed how few bowls and dishes there were. In checking the inventory I discovered that items were missing. It was difficult contacting the housekeeper whose cell was not set up to receive messages. When I finally was able to inform the house-keeper, she told me to ignore her own inventory that it was just "wear and tear" and that I would not be held responsible for missing items. Finally, after prodding, she did buy some more dishes and bowls but not until the last week of my one month stay. I had been told to turn off the gas lead to the barbecue but there was no gas container. The house keeper brought one over but, when it did not fit, gave up. In short I did not have the use of the barbecue despite it being listed as an item in the inventory. The bar stools in the kitchen were ridiculously high for the counter top and could not be adjusted. Lacking was a table along the bed but only a high dresser. Some cleaning supplies were missing and the housekeeper told me she hastily cleaned up before my arrival when she finally did bring over the supplies. The portable air conditioning unit in the bedroom produced more heat from the back than cold air in the front. In addition it was extremely noisy. When it was off the bedroom was overly-warm during the night as the windows only opened a crack probably for safety reasons. Outside of using the coffee maker and toaster I rarely used the kitchen. Still, I was falsely accused of having broken the vent over the microwave resulting in the purchase of a new microwave and the loss of a large chunk of my deposit. If I learned anything it was that prospective renters must demand to be accompanied on a walk-through prior to settling in and a second walk-through upon leaving. Anything less than that would jeopardize the deposit. Let the buyer beware. Very sorry for this persons experience at our condo. We have been running it for 10 years and never had a problem like this. We have usually had great compliments on our cleaning lady. We will be looking into your complaints and if need be replace her. The location worked out very well for our golfing vacation. My golf buddies and I booked this condo for our annual tournament. Well run from the initial contact with the owners to the greeting when we arrived. There were plenty of beds to accommodate our group comfortably and plenty of information material and books on nearby restaurants, main attractions. 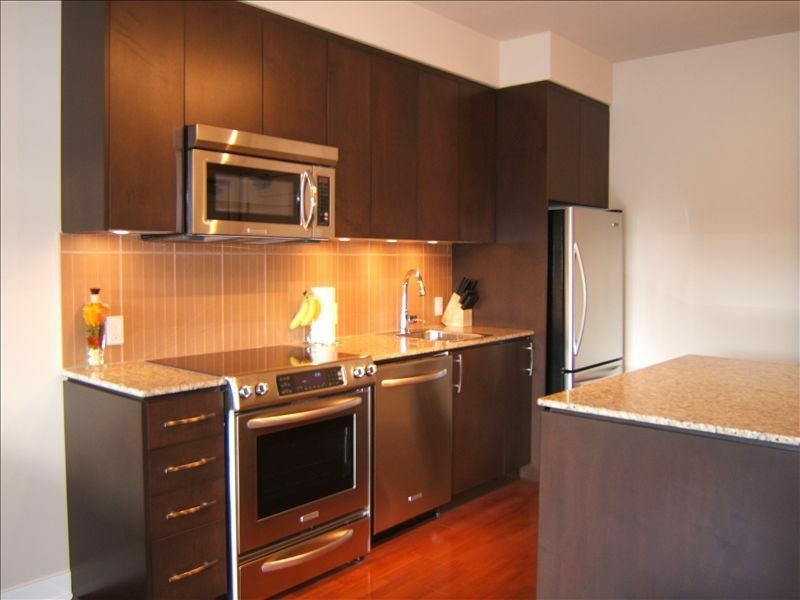 This condo has a well-equipped kitchen with all utensils and spices you need. The location was perfect. This condo is a great value. If staying longer then 1 Week a higher Damage Deposit may be charged.